Two years ago today - assuming you're reading this on May 15 - the long-awaited sequel to Diablo II launched to the eager masses. It wasn't all smiles and sunshine at first, as the sheer popularity of the title created server problems for many users. It was only a few days before the bulk of the problems were cleared up, and everybody was free to venture through Sanctuary, cleansing it of the demonic invaders. Much fun was had by all in the persistent quest for gear upgrades and new legendary loot drops. Fast forward to just a couple of weeks ago, and Reaper of Souls brought a whole new gameplay experience, with tailored loot drops - this meant you could actually USE many of the legendary items you painstakingly farm for, which was one of the biggest complaints about the purely random drops from the original launch - as well as the new adventure mode. It has been well received thus far, and a resurgence in active players was all but inevitable. That resurgence could get even more pronounced this week as Blizzard has revealed that, as part of the anniversary celebration, all players logging in this week will receive double Rift Fragments and a +100% boost to their chance to find Legendary items. The bonus has already begun and will continue until Thursday, May 22 at 5:00 a.m. PDT. Despite hundreds of thousands of players now having had a full two years to explore the world of Diablo III, after talking with the Diablo team, it seems there are secrets people have yet to uncover. 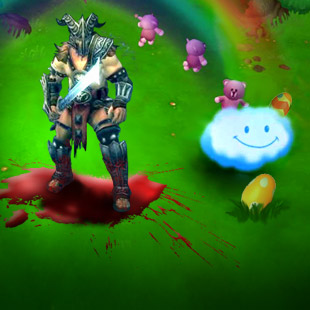 In addition to listing out a few of their favorites, the good folks at Blizzard have offered us a little bit of insight into just how the Easter Eggs process works. What makes a good Easter Egg. What makes a bad one. Why some get included and some don't. And how the process has evolved since the golden days of Warcraft II. In addition to some Q&A with the Diablo team, we've also teamed up with Blizzard to set up another giveaway. At the end of this article, residents of US and Canada can enter to win one of two Reaper of Souls Collector's Editions! We're pretty excited (and a little jealous, as I only have the standard edition) to be able to offer these up. I do apologize to the international readers out there, but keep an eye out for more international giveaways in the coming weeks! 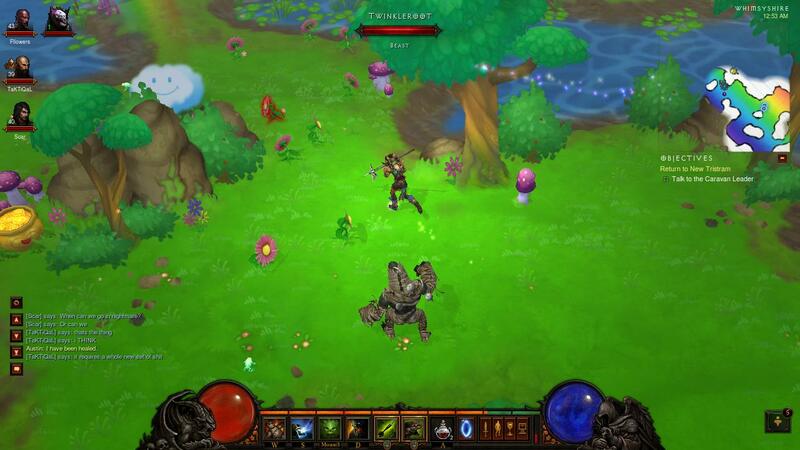 Without further ado, let's hear what the Diablo team has to say about Easter Eggs. I asked the team for the top three Easter Eggs. They gave me six instead. The top of the list is exactly what you'd expect: Whimseyshire. It's no wonder that it's their favorite inclusion, as the work that had to go into creating a whole level with an entirely different aesthetic from the rest of the game had to be staggering. The team had so much fun making the not-Cow-level that it was even described as "the reward we gave ourselves for finishing the game." While they never expected to be able to top the original cow level - and the novelty of that for its time is still arguably unbeatable - the team was "really happy with the result!" As well they should be. The first time I managed to piece together the Staff of Herding and make my way to Whimseyshire, I was absolutely blown away. It's so bright and colorful, fun and whimsical, and devastatingly dangerous. You wouldn't think fluffy clouds would hit so hard.